Kings and queens, religious and military leaders… The current SP-Studio contest about FAMOUS LEADERS is all about power – in good hands and in bad hands. This time the task was to create a SP-Studio version of a real life person, no fictional characters. And your uploads are great! You can now vote by liking your favorite pictures until November 30th. Visit the CONTEST PAGE now. The last contest about the topic HALLOWEEN PARTY was won by Alex J. Giebelestein with his picture about Butters as Jason Vorhees. Congratulations! You can see the Top Five of past contests in the HALL OF FAME. Join the SP-Studio contest! This month the topic is HALLOWEEN PARTY, so you can show your creepiest, funniest or most creative costume ideas. But if you want to show a general Halloween party setting / decoration this is allowed as well. Submit your image on the CONTEST PAGE until October 20th. You can also send it to me via Facebook message or Email if you prefer this way. On October 21st all the pictures will be shown on the contest page and you can vote for your favorites. The last contest about the topic FIGHT! was won by Jeffrey with his picture about Glass Joe vs Mr Sandman from Punch-Out!!. It was inspired by this YouTube video. Congratulations! You can see the Top Five of past contests in the HALL OF FAME. You might have noticed that there was no SP-Studio update in September. I have to deal with some health issues right now, but I hope to be back soon. I gave the beard category a complete makeover, and I am sure it will be a lot of fun to build bearded characters now :). New beards were added and old ones look better now. In total there are 77 different parts for beards now. The structure has become more intuitive while giving you more freedom to be creative. There are mustaches and chin beards now (and some special items located beneath those), which can be combined to full beards. This means 1188 possible combinations to create the unique beard you always wanted! Not even counting the special beard items. Shadows and highlights are available for many beards now and can be switched on and off when you add them to your picture. A new SP-Studio picture contest has started! It would be wonderful to see as many or even more creative pictures as last time. Submit your unedited SP-Studio picture on the CONTEST PAGE until August 20th (or via email or Facebook message). The topic for this month is VIDEOGAME HEROES. From Mario to Sonic and from Duke Nukem to Lara Croft. All the pictures will be shown on the FACEBOOK PAGE on August 21st and then you can vote for your favorites by liking them on Facebook or voting in the SP-Studio forum. The winner is granted a free wish of a SP-Studio of his or her choice. Good luck! The last contest about BLOCKBUSTER MOVIES was won by Scott with his picture about Avengers: Infinity War. Congratulations! You can see the Top Five of past contests in the Hall of Fame. Thanks to everbody for sharing your amazing pictures! But let’s not forget about last month’s winner. Congratulations to legobasher! He created a portrait of David Zellaby from “Village of the Damned” for the CHILDREN contest. You can find all winners in the old contest gallery or visit the Hall of Fame. Right now I run a poll for my 5$+ Patreon supporters where you can choose which superhero costumes you want to see in the next updates. The last SP-Studio picture contest about STEPHEN KING had two winners: Congratulations to legobasher and Zawesome! Their pictures were inspired by Stand by Me and The Shining. You can see the results of the contest in the gallery SP-Studio contest 05/2017: STEPHEN KING. Thanks to everybody for your amazing artworks! The new contest topic for June is CHILDREN, so you can create a SP-Studio picture about any young human being (or animal… or alien…). How about Kevin from the “Home alone” movies? Or do you want to show a random kid? This is a free topic, so it’s up to you what you make of it. Submit your picture until June 20th. You can read more about the rules here. As always the winner can make a wish for a SP-Studio update. Good luck! Sorry for not posting about the last contests in this blog, but I will try to honor the winners here again from now on. Let’s start with Jetpack-guy for winning the last SP-Studio contest. Congratulations! It was SP-Studio contest 04/2017: FAMOUS PETS and his creative artwork shows Ham, the first American in space. The current contest for May is about STEPHEN KING. From Carrie to It and from The Dark Tower top The Shining – create a SP-Studio picture about one of his books or movies! Or perhaps you want to show the famous author himself? It’s up to you. Submit your picture until May 20th. You can read more about the rules here. We would LOVE to see new SP-Studio artists, so register a nickname for the community and give it a try. The winner is granted a wish for a SP-Studio update. Good luck! …and the two old footballs look better now. Most of these items were wishes by the SP-Studio community. The first SP-Studio update in 2017 brings futuristic armor for your characters! My Patreon supporters were allowed to select the topic for this update in a poll and this resulted in “cyborgs”. So I designed 4 different types of body armor and fitting helmets. The goal of this update was to give you the freedom to combine those parts and be creative, no matter if you want to make a robot, super hero or space marine. You can select your favorite colors and turn shadows and highlights on and off for each of the new items. This feature might come to the rest of the freestyle collection in future updates as well. I improved two of the existing helmets to give you more freedom in how to color them and finally the freestyle collection was cleaned up to make it easier to find what you need. 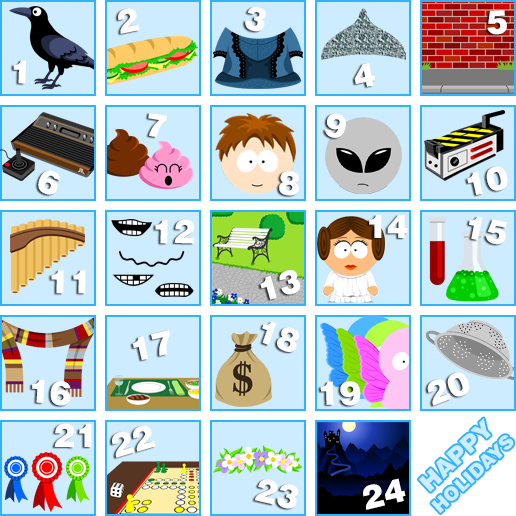 It’s time for the annual SP-Studio Advent Calendar with daily updates! From December 1 until December 24 I will surprise you with new SP-Studio items. This blog post and the front page will be updatet every day and I will keep you informed on Facebook and Twitter as well. The old Christmas Specials can be found here: 2008, 2009, 2010, 2011, 2012, 2013, 2014, 2015. Do you have a wish? You can request items in the blog comments or on Facebook and they might appear in one of the updates. I hope you enjoy the 24 surprises! The first one is a classic diving helmet. The SP-Studio forum will be offline for a couple of days. It was time for a big update and unfortunately this did not go smoothly. But it will be a better forum when it’s back! Right now I am not sure how long it will take, but I will keep you updated in the comments of this post. So if you are a member or even team member of the forum you can stay here while the forum is offline. A new button was included which allows you to switch the highlights and shadows on and off for every hairstyle! This means the old hairstyles are available in new variations, so make sure to revisit them to have a look. The “shadows” button can be found in the upper right corner when you select the color. I am sorry for the lack of updates during the past couple of months. This update might not seem like a big deal, but I had to put a lot of time into it to make it work. The coding in the background took a while and I had to change 214 files with different drawings. In combination with a lot of “real life work” I hope this explains my absence. The reason for this update was my own disappointment with my old drawings. My drawing style changed over the years and I prefer shadows and highlights now to make the hair look a little bit more realistic. I wanted to bring a more consistent look to the hairstyle category but I know some of my visitors love the classic flat South Park look. So how could I make everyone happy? That’s why I decided to offer the option to choose between those two styles. And removing the highlights might be helpful for those artists as well who like to use the items in different and creative ways. Congratulations to Jetpack-guy for winning the last SP-Studio contest! He created this black and white portrait of Coco Chanel with the title “La Petite Robe Noire”. You can see all entries for this contest here: SP-Studio contest 07/2016: FASHION. The current contest is about LOONEY TUNES VS NICKTOONS. When you think of funny cartoons of your childhood the Looney Tunes characters and Nicktoons will soon come to your mind. But who’s best? You can choose your favorite! Create a SP-Studio picture about a Warner or Nickelodeon cartoon character. Of course you are allowed to include both in one picture, but this is not required. Submit your picture until August 20th. Read more about the rules here. Good luck! On December 2, 1983, John Landis’ videoclip “Thriller” was released. Strider created this SP-Studio portrait of zombie Michael Jackson for our last picture contest and won. Congratulations! You can see all entries here: SP-Studio contest 06/2016: MUSIC OF THE 80s. And check out the all time HALL OF FAME! There is still time until tomorrow to enter the current contest about FASHION. Come up with creative clothes by combining different items! Or you can show a scene a from a fashion show. Famous models and designers are another possible motif. Or how about a critical look at child labor? I am excited for the pictures this topic might inspire. Read more about the rules here. Good luck! 16 new clothes were added to the SP-Studio! Eight printed t-shirts, five dresses, a corset in custom colors, a fashionable tuxedo and a pea coat. This time I focused on “normal” clothes, because we had a lot of special costumes lately. The shirts are splitted into 4 instead of 2 categories now, so it’s less chaotic. In the “dresses” category you can move your cursor over an item to learn about what it was inspired by (movies, celebreties, traditional clothes from certain countries,…). I plan to include this feature for the shirts as well, but want to wait for your feedback first. Caribou won the last SP-Studio contest! His picture was inspired by George Orwell’s quote: “If you want a vision of the future, imagine a boot stamping on a human face – forever.”. You can find the whole contest gallery here: SP-Studio contest 05/2016: THE FUTURE. And check out the all time HALL OF FAME! You have still time until tomorrow to enter the current contest about MUSIC OF THE 80s. The forum thread with the rules can be found here, good luck! Congratulations to legobasher for winning the last SP-Studio contest! His picture was inspired by the Movie “Grunt!”. You can find the whole contets gallery here: SP-Studio contest 04/2016: PRO WRESTLING. And check out the all time HALL OF FAME! A reminder: Today is the last chance to submit your pictures for the current contest. I am sure everybody thinks about this topic a lot: THE FUTURE! No matter if you create a SP-Studio picture about your own future or Star Trek, as long as it is related to the topic in some way it will count. So show your creativity and I hope to see many entries! The rules are described here. How about some statistics? I never posted anything like this before, but it might be interesting bonus content between updates. Have you ever wondered which items are the most popular on sp-studio.de? Here you go! I looked through data from the last months and created this top 20 of SP-Studio items. “Popular” means these are the items which get the most clicks. It does not mean they have to be actually used in the final pictures (I cannot count this). Excluded from this list are the body shape, single color background and regular hands. Of course they are the top 3 items because every SP-Studio picture starts with them. As you can see the basic items are really important. But some fashionable shoes or the manga eyes seem to attract your attention as well. Last month’s picture contest was won by Jareen2 who created this cool portrait of Kurt Cobain. Have a look at the complete contest gallery here: SP-Studio contest 03/2016: MUSIC OF THE 90s. The current contest is inspired by Wrestlemania. Let’s create some SP-Studio pictures about professional wrestling! You can pick famous WWF / WWE super stars like Hulk Hogan, the Undertaker or John Cena. Or how about different Wrestling leagues like the ones from Mexico or Japan? Today is the last chance to submit your picture! The rules are described here. After the Disney Princesses and Star Wars these are the final costumes in a row of pop culture inspired SP-Studio updates. When it comes to iconic video game characters nobody can compete with Super Mario. So I drew this tribute to Mario and Luigi. My Patrons voted for the Nintendo characters they wanted to see. And check out the Princess Peach dress and hair as well, which was already included a while back. I fixed some bugs as well: The U.S. flag works again and some noses were moved. Congratulations to Caribou for winning the last SP-Studio contest! All of Have a look at the complete contest gallery: SP-Studio contest 02/2016: LOVE / Hall of Fame. The contest topic for March is “Music of the 90s”. I will give you an extra day to submit your pictures, so the deadline is Monday evening. Create a SP-Studio picture about the glourious 90s’ music! Home of Boybands and Eurodance, Nirvana and Britney Spears. I guess most of them will show a certain artist, but you are allowed to be creative with the topic. All the rules are described here. Creative pictures were submitted to the last SP-Studio contest! The best rated one was inspired by the popular horror game “Five Nights at Freddy’s”. Congratulations to Eggyslav! Have a look at the complete contest gallery: SP-Studio contest 01/2016: What happened in 2015? / Hall of Fame. I don’t celebrate Valentine’s Day, but many others do. So I picked this emotional topic for the February contest: LOVE. Submit a fitting SP-Studio picture to the contest gallery until February 20th. Hurry! :) All the rules are described here. The winner can wish for a new SP-Studio item of his choice and I will draw it.